The 2011 Census report in India showed that 75% of the elderly lived in villages, of which 48.2% were females and 55% of these were widows. About 65% of the elderly were dependent on others for their daily living. India is currently home to 104 million elder, which comprise about 8.6% of the population of the country. This is only projected to increase to 20% by the year 2050. When we look at Maharashtra in particular, 9.9 million people in Maharashtra are over 60 years of age. Majority, i.e., 5.2 million are women and the remaining 4.7 million are men. This comprises about 10% of the population of Maharashtra, which is higher than the national average of 8.6% mentioned earlier. Further, among all elder in India, one in ten resides in Maharashtra. In addition, majority of the oldest old (above 80 years) reside in the state of Maharashtra. All these make it very important for the Government of Maharashtra to have a plan for elder care, besides the existing national policies. This narrative review hopes to outline the gap between the desired eldercare model and the existing facilities, to help pave the way forward for better overall planning in the state of Maharashtra. Existing data are very little, and hence the few studies done will be discussed. There are some small unpublished data that the authors themselves have researched, and this too shall be discussed. To understand how to approach elder care services, it is important to understand at first what would be ideal services to offer individuals above the age of 60. 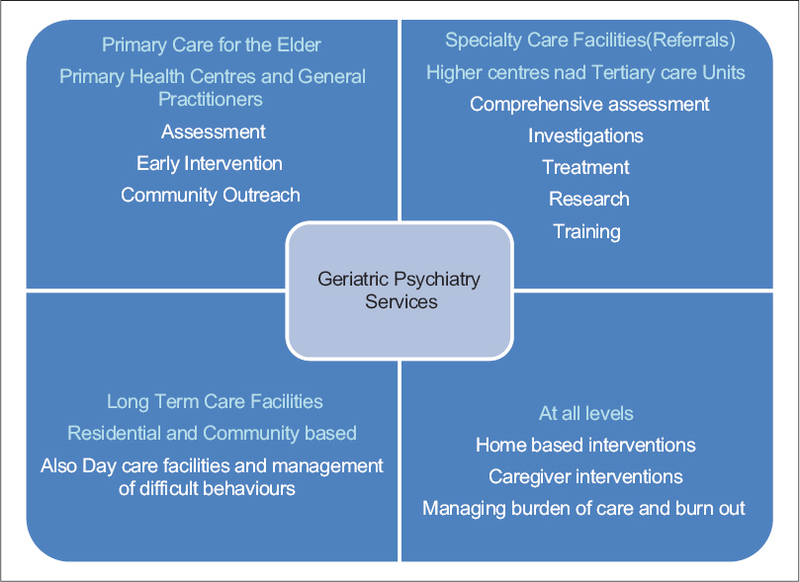 The goal of the geriatric psychiatry services should be to provide integrated health care to elderly with an aim to improve functioning and to promote independent living. WHO gives guidelines on “Integrated care for older people.” These guidelines focus on community-level interventions in elderly. The stress is mainly on improving and preserving intrinsic physical and mental capacities of elderly and also providing support to caregivers. It emphasizes more on healthy aging than illnesses and disabilities. Thus, the main goal of the services is retaining functional capacities. However, these integrated services have to be delivered at the community level integrating it with primary care and through outreach programs. Important issues such as loss of mobility, nutrition, visual and sensory impairment, cognitive impairment, and depressive symptoms are handled in these guidelines. 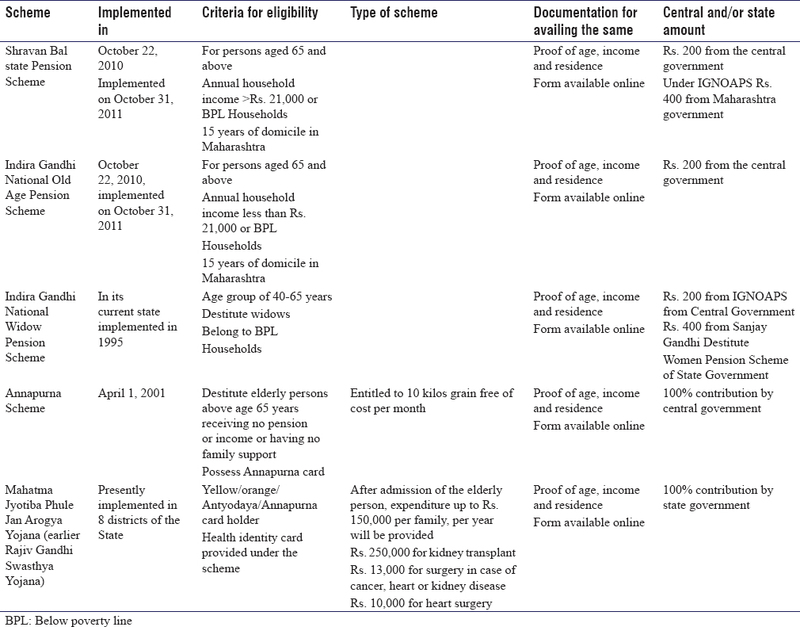 [Figure 1] gives an overview of the geriatric health care planning. The following principles of health-care delivery are proposed to provide integrated care to elderly population. Accountability: The service providers have to partner with the stakeholders. They have to address the expectations of the elderly people and caregivers, i.e., family members in most of the cases. They also need to evaluate the existing services from time to time and plan for the future needs. Specific specialty services: For emotional, behavioral, and cognitive problems specialty services such as geriatric outpatient department (OPDs) and memory clinics are available. The other major component of elder care services is community care and outreach programs. Such outreach programs are able to address issues of availability of services, compliance and referral, and also issues related to caregivers. Having said that, however, the need for specialized services cannot be undermined. Specialty clinics attending only to elderly population having mental health problems are developed with an emphasis on a comprehensive assessment and management. Such centers have multidisciplinary teams comprising a psychiatrist, physician, neuropsychologist, occupational therapist, and if possible a social worker. The clinics also have the facility to refer to other specialties such as neurology and an orthopedics. Self-care management with the help of family members is thus another of the aims of geriatric services. While planning elder care services, long-term care facilities form an integral aspect in the planning. Caregivers find it difficult to manage their ill patients at home, especially in nuclear families and when everybody at home is working. Sometimes, the nature of the illness, behavioral issues, psychobehavioral symptoms of dementia, etc., make caregiving at home very difficult. Hence, there is the increasing need for long-term care facilities, available easily, and cost-effectively. Long-term residential care services as well as day-care centers for elderly which are affordable and accessible form the last leg of planning complete elder care health services. It is important to empower the staff in the specialty clinics, in the outreach programs and in the primary health-care system. They have to be trained to identify symptoms of common disorders, monitor compliance, and handle various concerns of the caregivers. Caregivers themselves need training in managing patients at home and also need help in managing their burden of care. Formal training in geriatric psychiatry in terms of a university course/fellowship or degree is also needed. There are only four centers in the country offering a DM course in geriatric psychiatry and some offering fellowships. [Figure 2] depicts a bird's eye view of integrated health-care service planning  for the elder. One out of every 10 elder individuals had been hospitalized in the past year, at any given time cross sectionally. What was interesting was the preference for hospitalization in a private set up, rather than availing government facilities, even if that meant incurring a cost of approximately Rs. 5500 per time, which was largely provided for by the children of the elder individuals. The above health profile paints a picture of high medical morbidity in general medical as well as psychiatric settings, and that is an area which is a potential gap in provision of health services. The rest of the studies carried out earlier and had focused on the social demographics, social trends, and population statistics with particular reference to the elder. The authors themselves have unpublished data of a small informal survey they carried out among 100 psychiatrists residing in the state of Maharashtra. This was pilot data, using the methodology where a 10-item questionnaire was sent over the mail and Whatsapp, to get a brief overview of the existing health services in the state, from the perception of the psychiatrist alone. All psychiatrists registered under IPS West Zone and Bombay Psychiatric Society, residing in the state of Maharashtra, were contacted by the above means. Data from the first hundred respondents were collated and analyzed. Implicit consent was obtained in the information meted out that this was pilot data being gathered, which may be published. The authors hope to further the study with a larger sample, and a more detailed questionnaire, and more robust methodology for which ethics approval will be sought. Do work in a corporate, private (self), or an institutional setup? If institutional–government or private? Do you run specialized geriatric services of any kind? If yes, what kind of services? How many geriatric patients (on an average) do you see in a month? 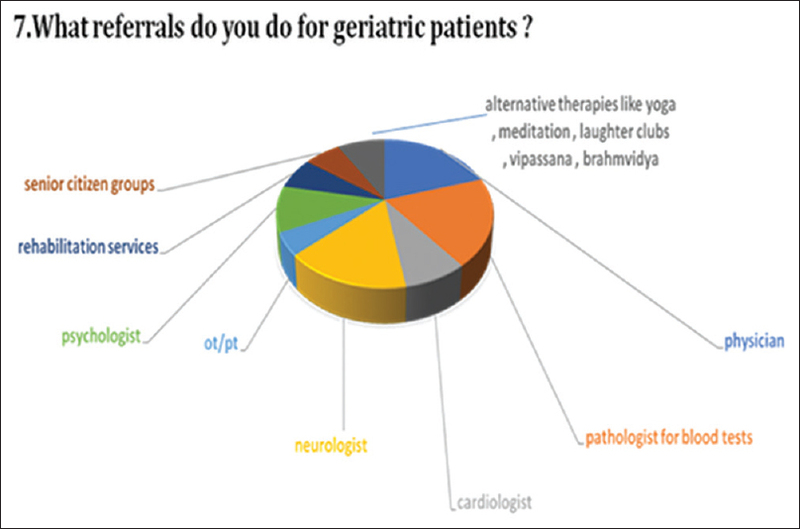 What referrals do you do for geriatric patients? How do you usually evaluate the patient? What facilities besides OPD do you have for geriatric patients in your setup? The findings from the survey are discussed as below [Figure 3]. Most of the respondents were from individual private setups, approximately two-third of them. Of the remaining, 10.2% worked in a corporate setup, whereas the rest worked in institutions. This is a fair representation of the distribution of health services available to the community at large, with a bulk of services available in the private sector, followed by the teaching medical institutions and finally the corporate hospitals. 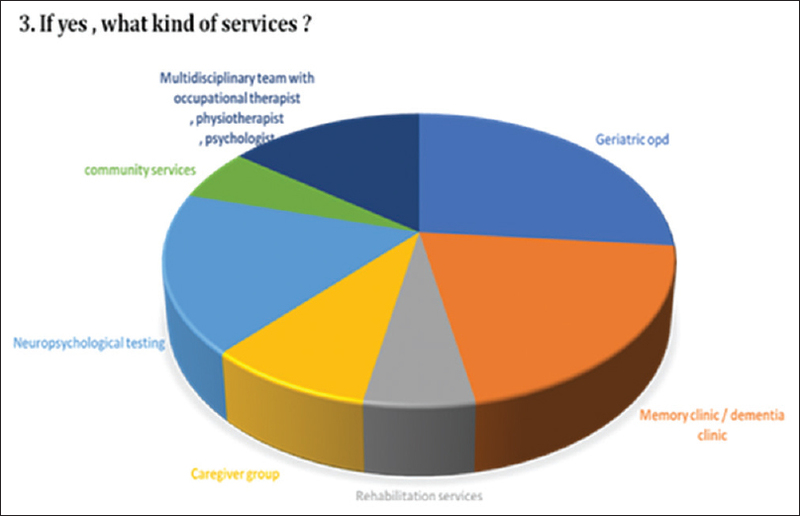 Only 33% of the respondents (n = 100) ran specialized services for the elderly. In teaching medical colleges as per the norms laid down by the Medical Council of India, it is mandatory to have a memory clinic and/or elder care outpatient services. 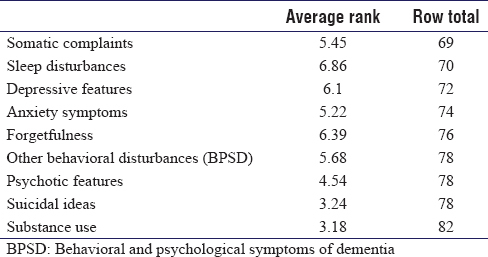 Some private practitioners too have clinics which specifically cater to memory testing and assessment for dementia [Figure 4] and [Table 1]. The type of service provided was restricted largely to memory clinics and outpatient care clinics. 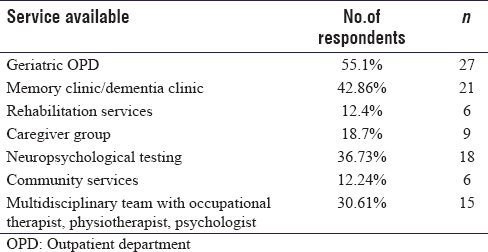 Community services and rehabilitation services very hardly available according to the respondents who chose to respond to this questions (about half n = 49) [Table 2]. Majority of the patients came in for disturbances in sleep, depressive and somatic complaints, and memory. Memory complaints and behavioral symptoms associated with dementia appeared to be the most common reason for a psychiatric consultation. Most of the patients were brought by caregivers (68.37%) for behavioral problems or referred by the psychiatrist themselves to the specialized clinic. Referrals from general practitioners, physicians, neurologists, and other medical fraternity were fewer. The evaluation was largely done on the basis of a detailed history and Mini–Mental Status Examination, and basic laboratory work up, with very few having detailed neuropsychological services available. None of the respondents had received formal training in geriatric psychiatry in terms of a university course/fellowship or degree. There are only four centers in the country offering a DM course in geriatric psychiatry and some offering fellowships. It is important for Maharashtra to consider taking a lead in this area too. Early recognition of geriatric mental health problems, and early intervention, may reduce overall burden of care. Patients evaluated by psychiatrists were referred to other faculties too; the most common referrals were for a blood workup to a pathologist, followed by a physician and a neurologist. About two-third of the respondents actually refer to all three or any combination of the above, depending on the availability of a neurologist/physician in their area. 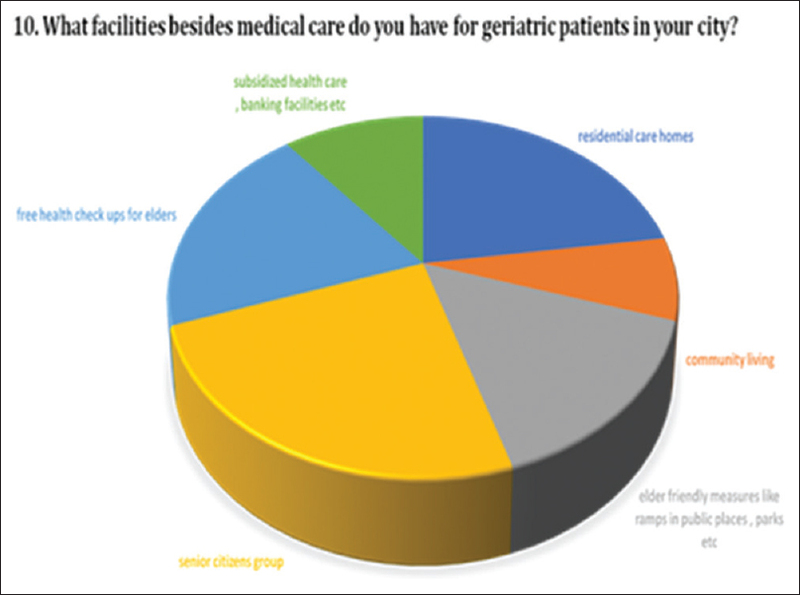 Finally, the respondents were asked about the facilities for elder care available in their geographical location (we had a mix of respondents from urban, semi-urban, and rural areas) [Figure 6] and [Table 3]. Most of the psychiatrists were aware of the presence of senior citizens groups, elder care homes, and availability of free health checkups for the elder. Community living, gated communities, and day-care facilities are sorely lacking in Maharashtra. The south particularly Karnataka and Tamil Nadu have pioneered ahead in establishing community living and exclusive gated communities for the elderly. Surprisingly, most of the respondents were unaware of the availability of subsidized health care and banking and other facilities, available in the state. The above survey was a very small effort at understanding the gap in elder health-care services in the State of Maharashtra. It has its limitations as it is merely a survey, assessed only the first 100 psychiatrists and only 10 questions could be asked as per the software protocol. It has not taken into account any inputs from psychologists, social workers, or community health workers in Maharashtra. Further, the statistical analysis is merely a representation of the mean values and the maximum and minimum responses. Hence, a further study can be designed using this preliminary data to study the same. In the BKPAI survey  carried out as well as the one done by the authors, majority of the elder individuals, and well as health professionals were not aware of the various policies available in the state. Unfortunately, there is a great lack of awareness of the various schemes provided by the government, among the general population, and the elder in particular. The Annapurna scheme had no takers till the last analysis was done, and the pension schemes too are poorly utilized. The Mahatma Jyotiba Phule Jan Arogya Yojana (earlier Rajiv Gandhi Swastha Yojana) has gained popularity only as it is integrated by the government hospitals in the hospital protocol and infrastructure itself. In addition to above state provided schemes, there are various financial benefits that the State of Maharashtra provides,,, to help elder individuals manage their individual/joint finances. 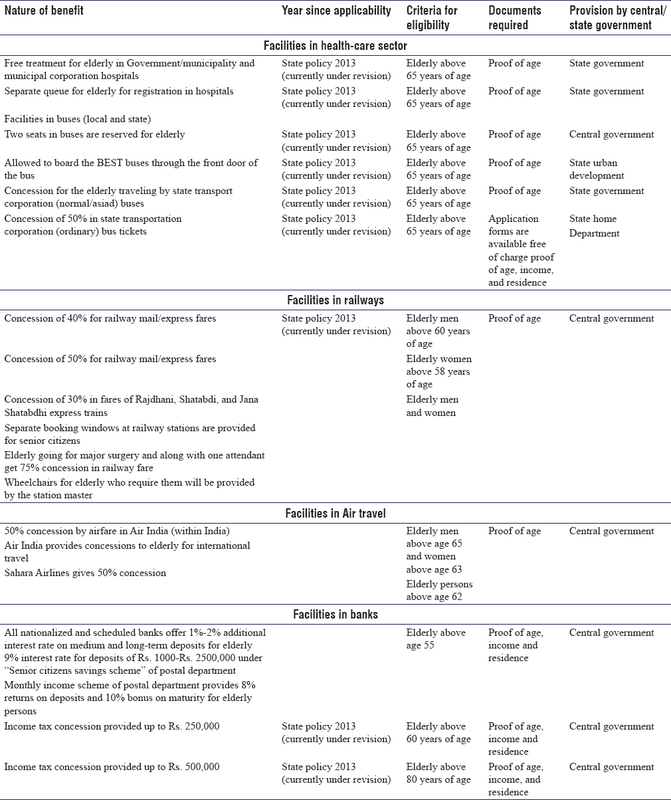 Here is a brief overview of these facilities [Table 5]. Majority of the elder individuals avail of the benefits of transport and discounted rates for transport facilities, along with medical care facilities. Fewer use the banking schemes and facilities, and even fewer use investment and insurance facilities. This could be due to lack of individual financial independence and control, which reflects our societal structure by and large. The lack of finances, and overall the lack of companionship, leads to a lot of problems of loneliness and subsequent depression too. Elder abuse, largely in the form of neglect, is very common. Rapid urbanization, nuclear families, and lack of an informal community, further add to a lot of isolation and neglect. Many of the offspring of elder individuals reside outside India. As a result, the loneliness cuts across all strata of the society. In fact in a bid to combat the same, many opt to stay in old age homes or elder residential care facilities where companionship is easily available, meals and medicines are given on time, and so it becomes a win-win situation for all. In the State of Maharashtra, there are about 62 old-age homes which are established using central government funding, 32 with state government funding, and 92 old-age homes  run by various NGOs such as Silver Innings and Dignity. These totally house about 10,000 elder individuals across the state, which is abysmally low, considering that we are one of the states which is home to 10% of the elder in the entire country. Furthermore, the concept of gated elder communities and community living barely exists in our state. Preservation of independence and dignity, along with a better quality of life, can be achieved through the same. Creating awareness about existing schemes as well as of healthy aging, by the use of media, ad campaigns, etc. Infrastructural modifications-like elder-friendly cities (with ramps, wheelchair services, etc., in all places and modalities of travel), more day-care centers, old-age homes, gated communities, assisted living, etc. The National Programme for Health Care for the Elderly  which has been implemented from 2011 by the Ministry of Health and Family Welfare, Government of India with a greater focus on elder care and health. It is a comprehensive policy that includes. In itself it actually covers most of the problems, we currently face. However, it is imperative to execute the same, in the spirit that it was designed. The implementation of the National Programme for the Healthcare of the Elderly, in toto, may mark the beginning of an elder-friendly era in our country. Chandramouli C. Census of India 2011 – A Story of Innovations. Press Information Bureau, Government of India http://pib.nic.in/newsite/efeatures. [Last accessed 2018 Feb 22]. Siva Raju S, Sulabha P, Dayakrishan M, Smita B. Building a Knowledge Base on Population Ageing in India January 2014 The Status of Elderly in Maharashtra. India: United Nations Population Fund; 2011. 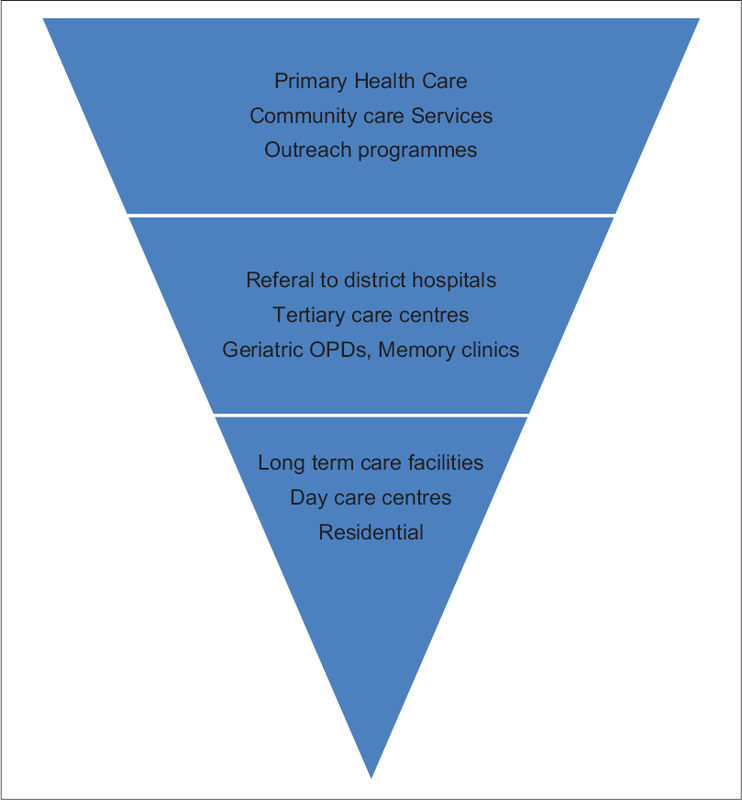 Guidelines for Elderly Mental Health Care Planning for Best Practices for Health Authorities. British Columbia Ministry of Health Services; 2002. World Health Organization. Integrated Care for the Older People: Guidelines on Community Level Interventions to Manage Declines in Intrinsic Capacity. Licence CC BY-NC-SA 3.0 IGO. Geneva: World Health Organization; 2017. Shaji KS, Arun Kishor NR, Praveen Lal K, Pinto C, Trivedi JK. Better mental health care for older people in India. Indian J Psychiatry 2004;46:367-72. Dias A, Patel V. Closing the treatment gap for dementia in India. Indian J Psychiatry 2009;51 Suppl 1:S93-7. Tiwari SC and Pandey NM. Health care challenges of indian older adults with special reference to mental health: An overview. Austin Palliat Care 2016;1:1005. Mane Abhay B, Khandekar Sanjay V, Kevin Fernandez VSM. India's ageing population: Geriatric care still in infancy. J Gerontol Geriatr Res 2014;3:186. Martha D. Oliveira Care Pathway for the Elderly: Detailing the model. Rev Bras Geriatr Gerontol Rio de Janeiro 2016;19:887-905.
mhGAP: Mental Health Gap Action Programme: Scaling up Care for Mental, Neurological and Substance use Disorders. Geneva: World Health Organization; 2008. GR for Pension Schemes for Elderly provided by Department of Social Justice (Special Assistance), Mantralaya, Mumbai. Available from: https://sjsa.maharashtra.gov.in/en/schemes. [Last accessed on 2018 Feb 24]. G.R for Annapurna Scheme Provided by Department of Food and Civil Supplies, Mantralaya, Mumbai. Available from: http://mahafood.gov.in/website. [Last accessed on 2018 Feb 24]. State Policy Rules for Maharashtra. (Currently under Revision), Mantralaya, Mumbai. 1st October, 2013. Publications for Public Domain Provided by Dept. of Social Justice (Special Assistance), Mantralaya, Mumbai. Available from: https://sjsa.maharashtra.gov.in/en/acts-rules. [Last accessed on 2018 Feb 24]. Government of India. National Programme for the Healthcare of the Elderly: an Approach towards Active and Healthy Ageing. Available from: http://www.jkhealth.org/notifications/bal456.pdf. [Last accessed on 2018 Feb 24].